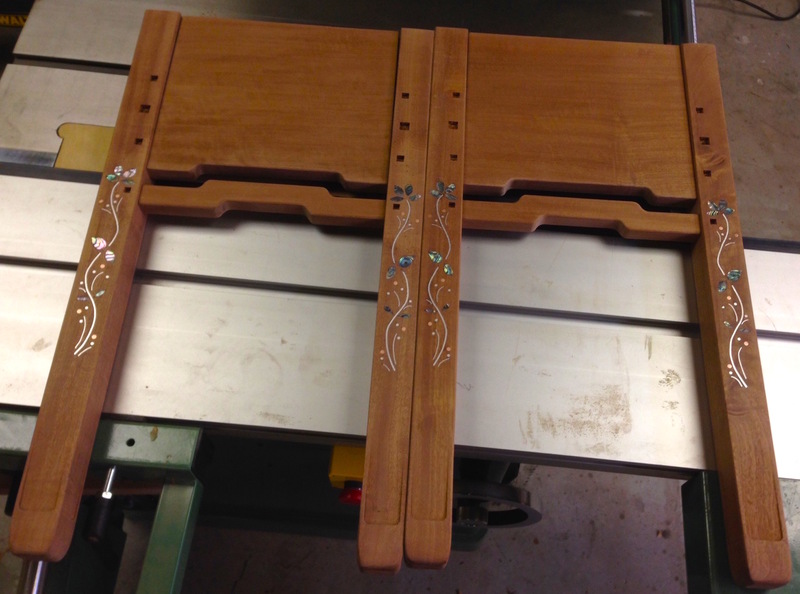 I just finished the inlay on the top of the Blacker Serving table I’m making. This went really smoothly. It’s not perfect, but it’s plenty good enough. I’m pleased that I was able to do all the processes end-to-end without any screw ups or stress. A good day in the shop. I started by laying out the design I wanted in CAD. It’s not identical to the original, but it has the same feel. I labeled all of the petals in my CAD drawing and printed out three copies. 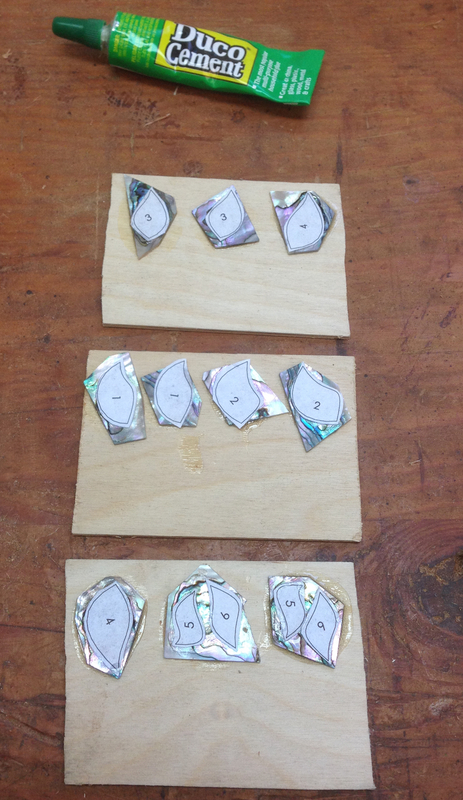 Two get cut up to glue to the abalone blanks, and the third is used as a reference and to trace the layout to the wood. 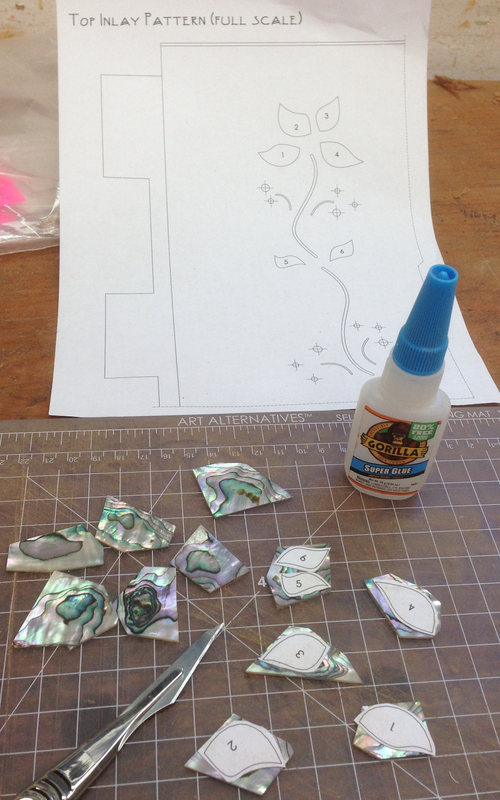 The pattern is cut into individual parts and glued to the abalone blanks with super glue. I had one extra piece of shell when it was all said and done. 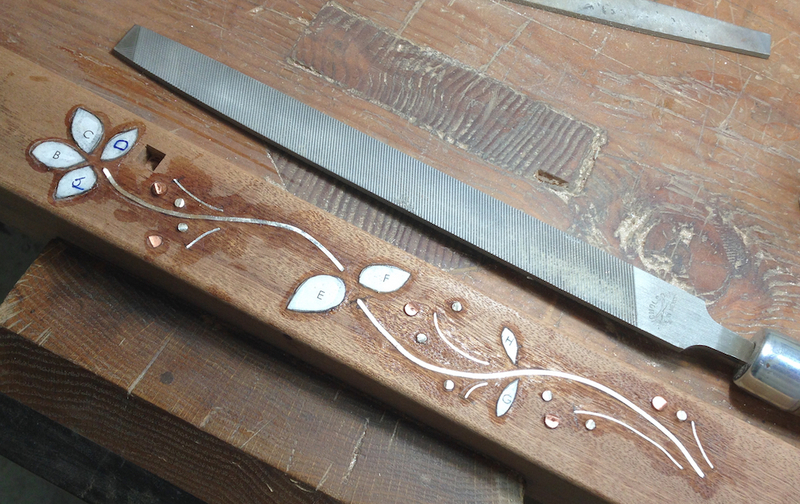 As on the legs, I’m using the Chevalet to cut out the petals, I’m more comfortable with that than using a jeweler’s saw for this step. I used the same technique as on the legs to handle the little pieces of shell. 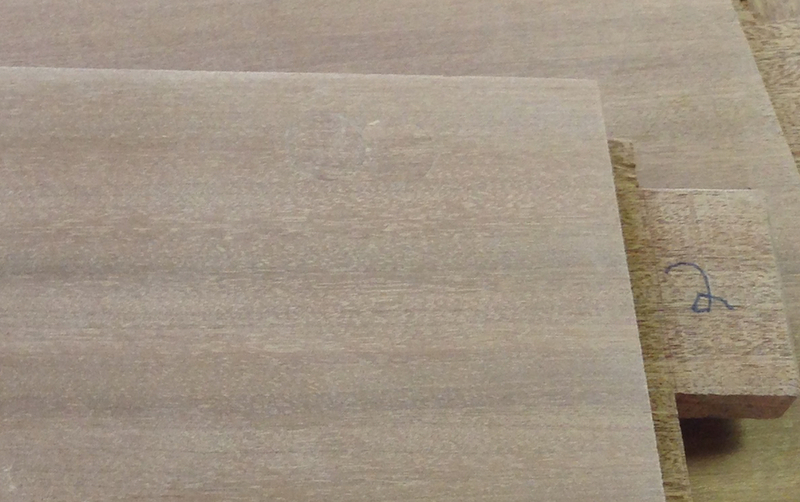 The shell blanks are Duco’d to 1/8″ plywood scraps. The plywood gives me something to hang on to while sawing, and helps support the delicate shell. I used the marquetry chevalet for sawing, you could use a jeweler’s saw or maybe a scroll saw too. The sawing went smoothly. One or two parts weren’t sawn exactly on the line, but nothing to fret about. 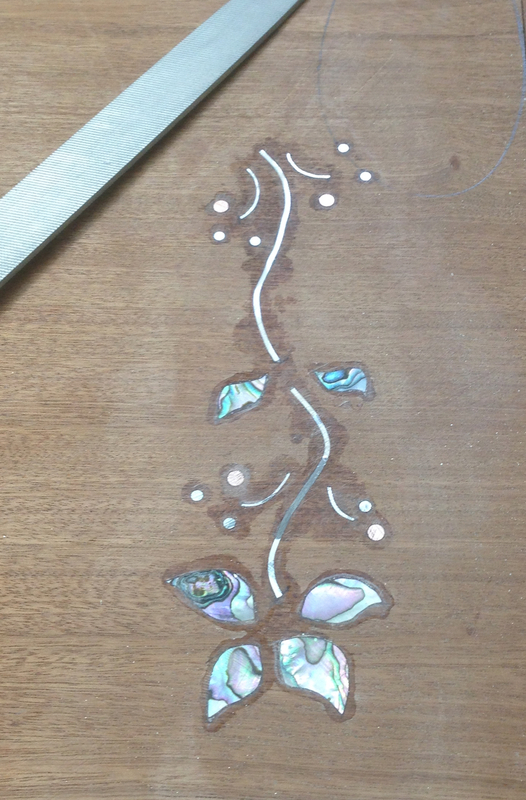 Once the shell petals were all sawn out it was time to do the layout for the inlay on the table top. 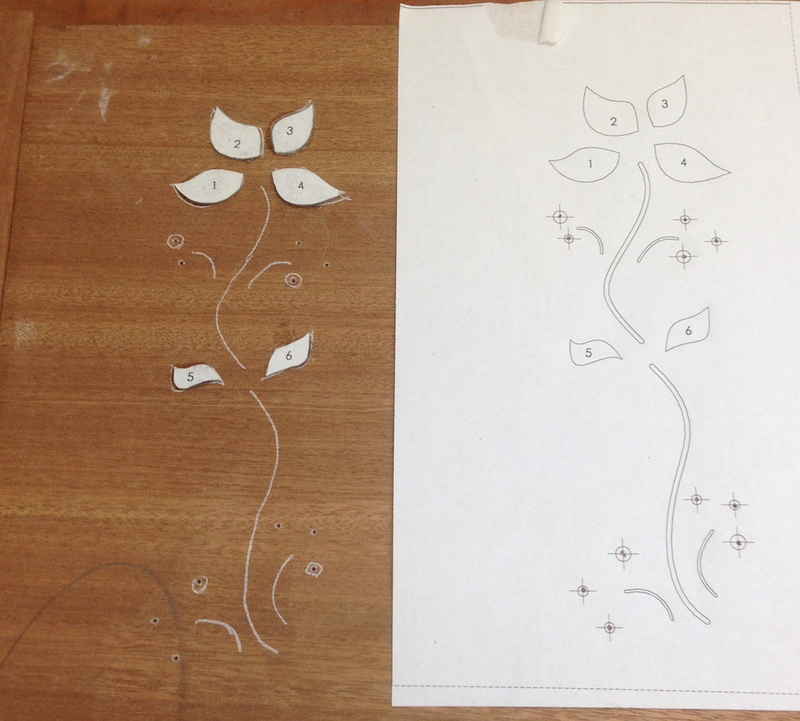 The layout is done in two stages, first tracing the design onto the top using Saral transfer paper, and then knifing in the exact outline for each shell part. The pattern is oriented on the top, with a piece of transfer paper under it. I trace the entire design. The tracing of the vines is used directly to route that part of the design. I mark the location of the “bugs” with an awl and then drill those. 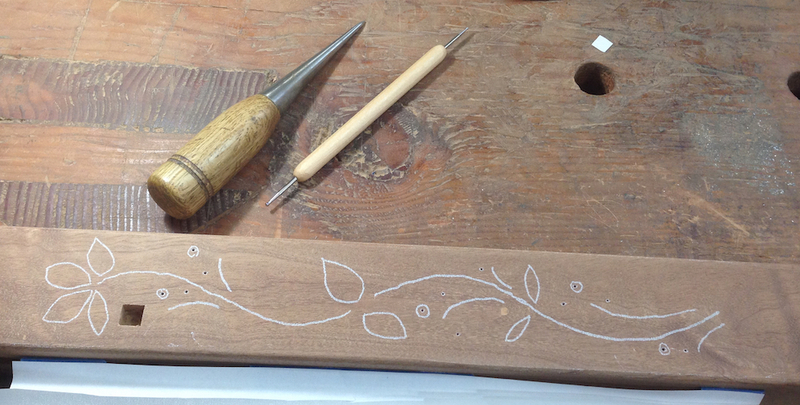 The traced pattern is accurate enough to freehand route the vines, but not to route out the cavities for the petals. 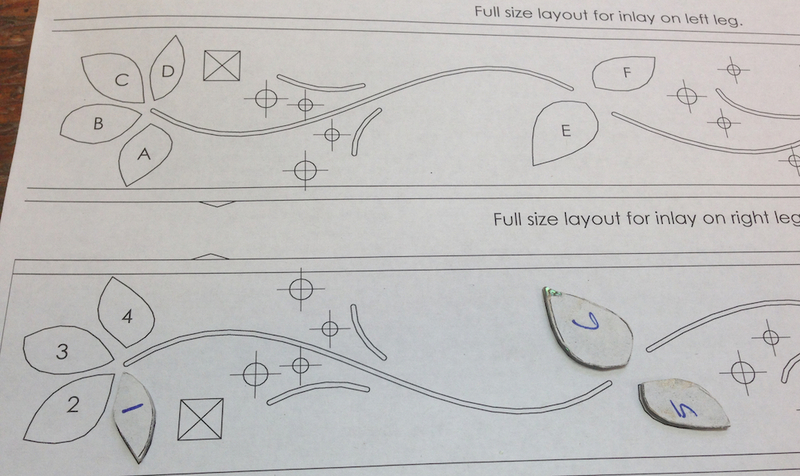 To layout the petals, I duco-glue the shell cut outs in place, using the tracing as a rough positioning guide. 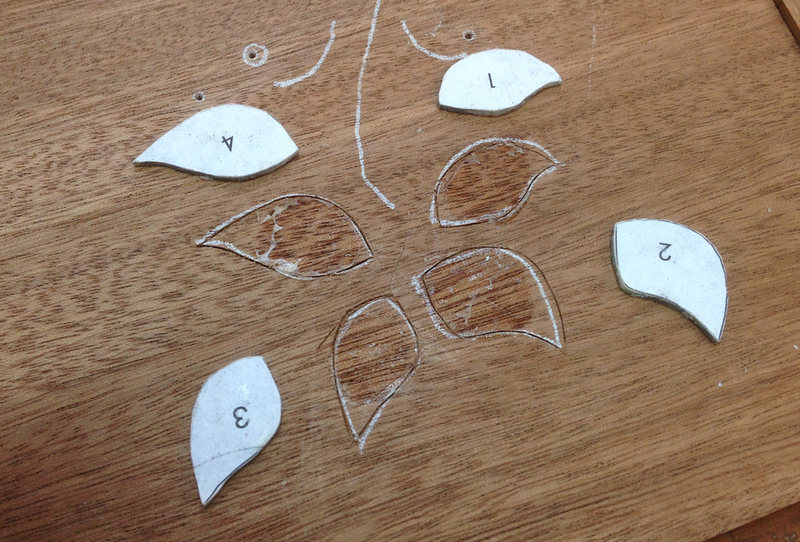 Then I trace around each piece of shell using a scalpel. The incised line gives me an accurate line to route up to. 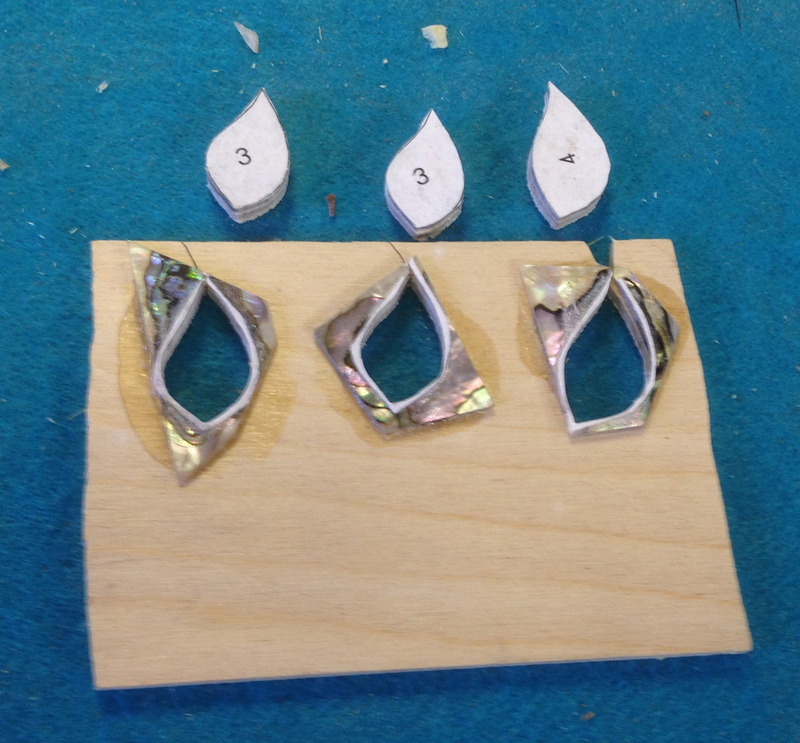 The shell, silver and copper is all super-glued in place. 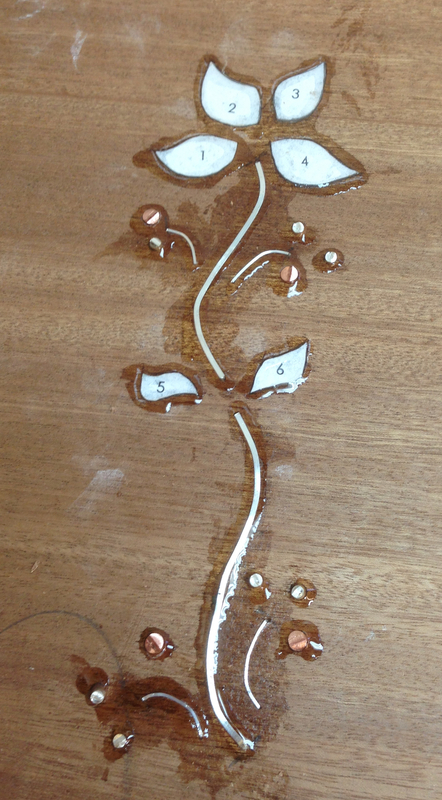 The petals and vines are .010″ proud of the surface. the “dots” are taller. It will all get leveled once the glue dries. 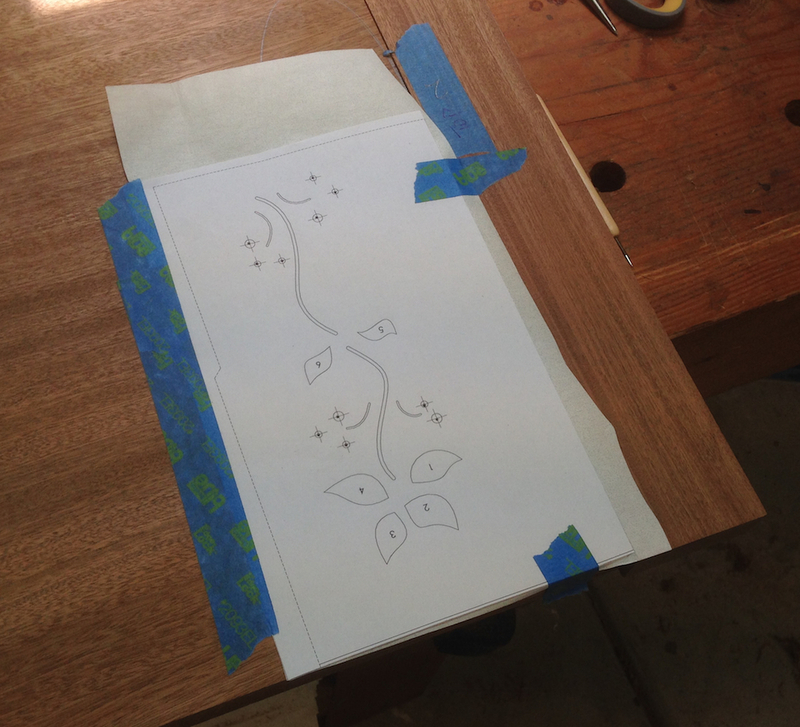 I start leveling the inlay with a medium file. This actually goes pretty quickly. 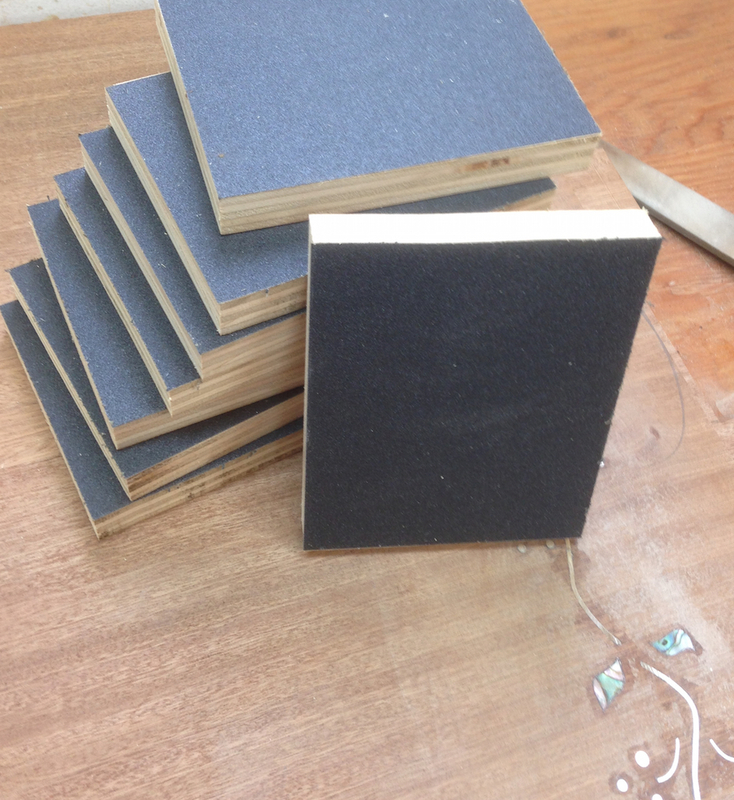 I made up these sanding blocks using scrap plywood and 120 grit sandpaper. It takes some elbow grease to get the last bit of glue cleaned up. 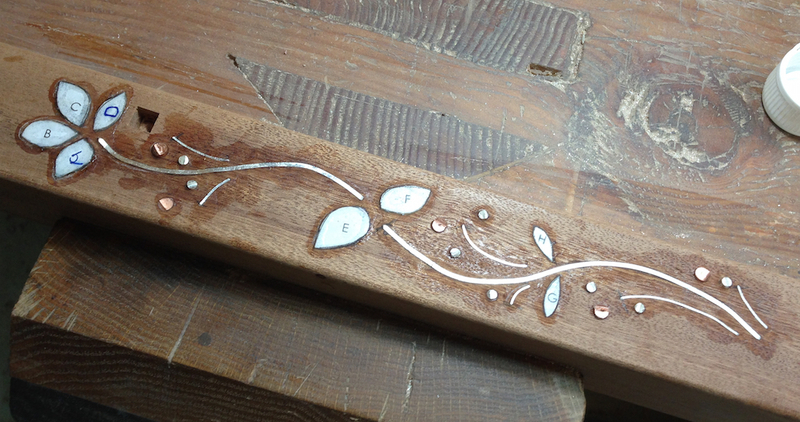 The inlay is sanded to 120 grit here. Once I do the Ebony splines on the ends I’ll finish sand everything to 320. When I started in on the top for the Blacker table the first thing I discovered was that the two boards I’d glued up for it had cupped. There was roughly a 1/8″ cup over 22″. Whoops, almost 1/8″ gap over the 22″ top width. Both of the individual boards appeared to have cupped slightly, but part of the problem was the glue joint. So I decided to rip, re-joint and re-glue the top. 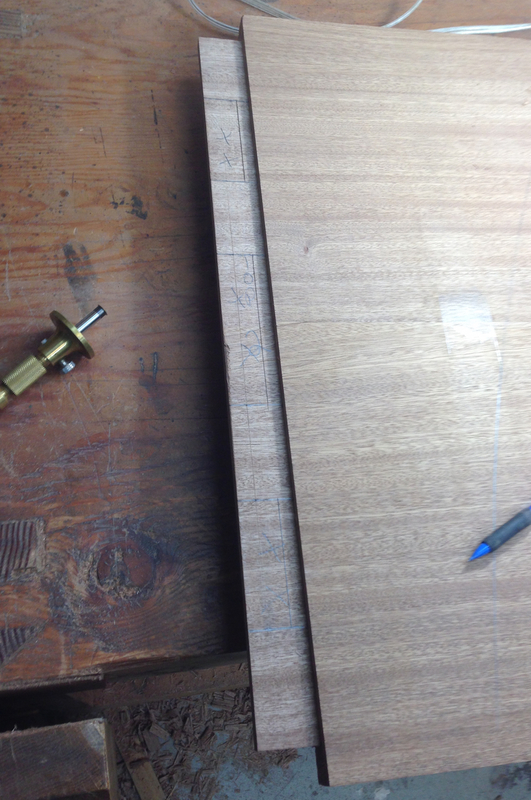 I used cauls to align the two boards for the re-glue. After 24 hours in the clamps I pulled it and re-checked…it looks good. Most of the top is dead flat, with a tiny bit of cupping at one corner. 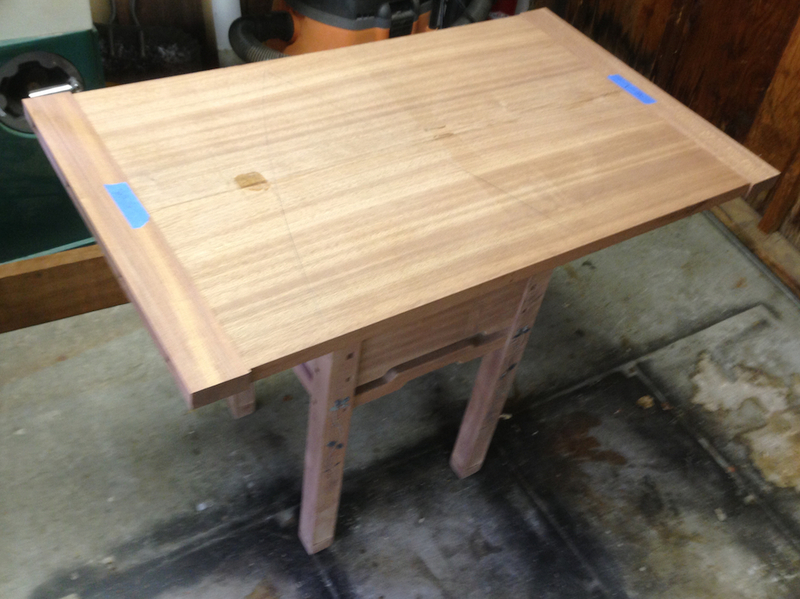 So I quickly but the tenons and assembled the top with the breadboard ends. I roughed in the step for the tenons using a dado stack on the table saw, then used a rabbeting plane to dial the fit in just right. 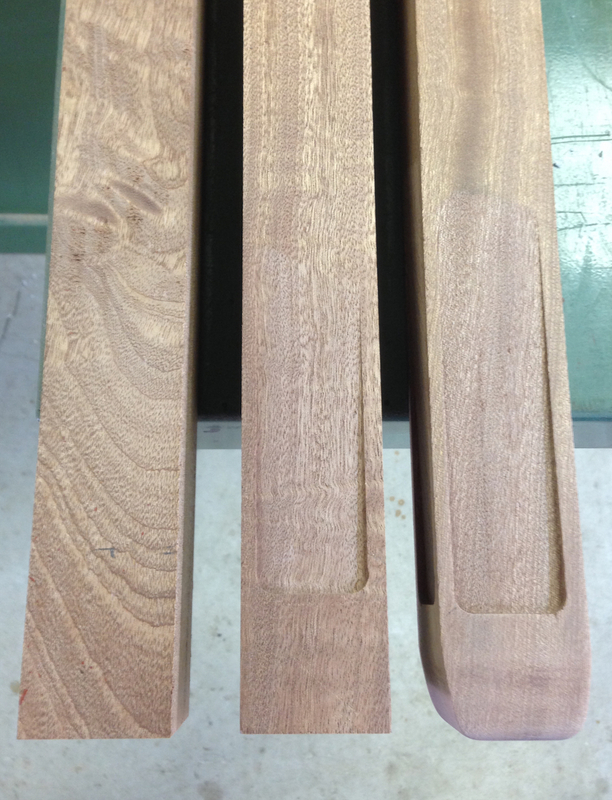 Layout for the tenons – there are four 1.375″ long tenons on each end, and a continuous .375″ stub tenon to help keep things flat. Success, breadboard ends are (mostly) done. I need to do a little fine tuning and cut the slots for the splines still, but I’m on the downhill side of this. I’ll do the inlay on the top next I think. When we left off our tale of the table I was trying to figure out how to make a jig to help produce the slot for the decorative ebony spline. It’s not really a difficult problem, but I complicated matters slightly by making the top a thickness that didn’t nicely match up with the available guide bushings. 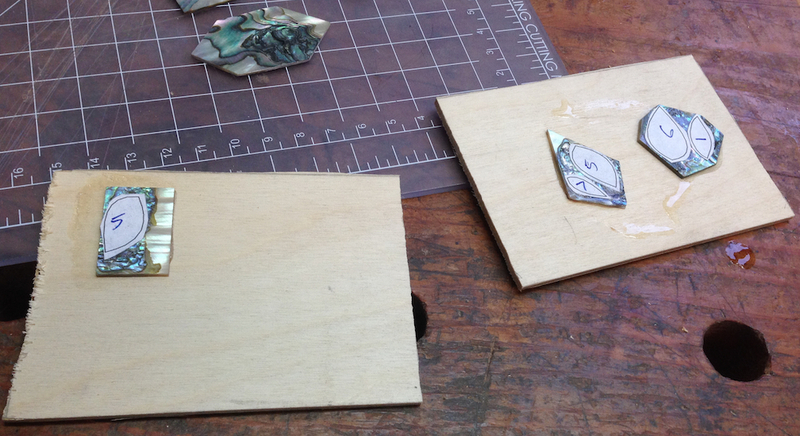 I adjusted my thinking for the jig by adding layers of veneer to make up the difference. 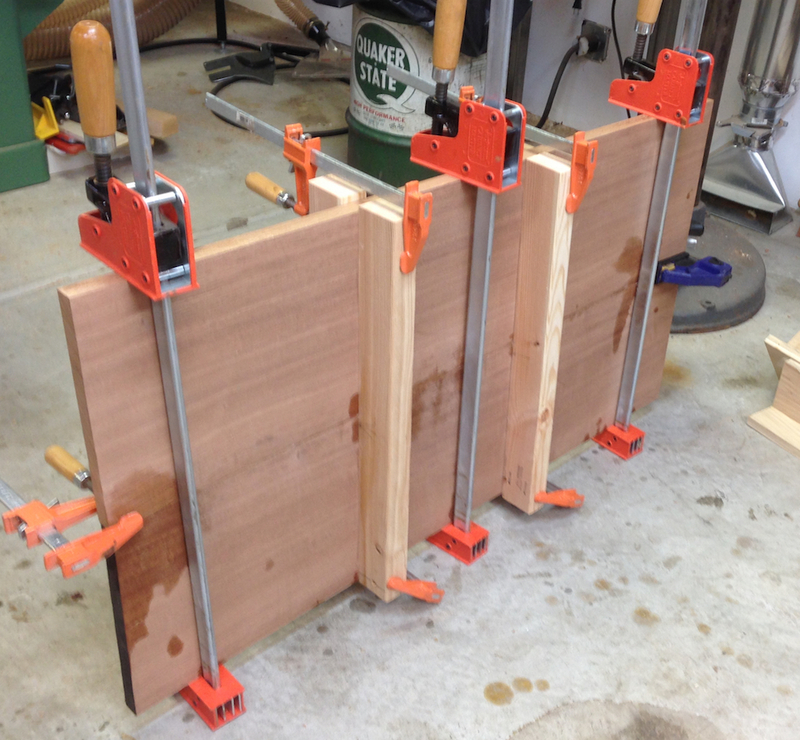 The jig fits over the edge of the top, and registers against the breadboard end to cut the 5″ long slot. 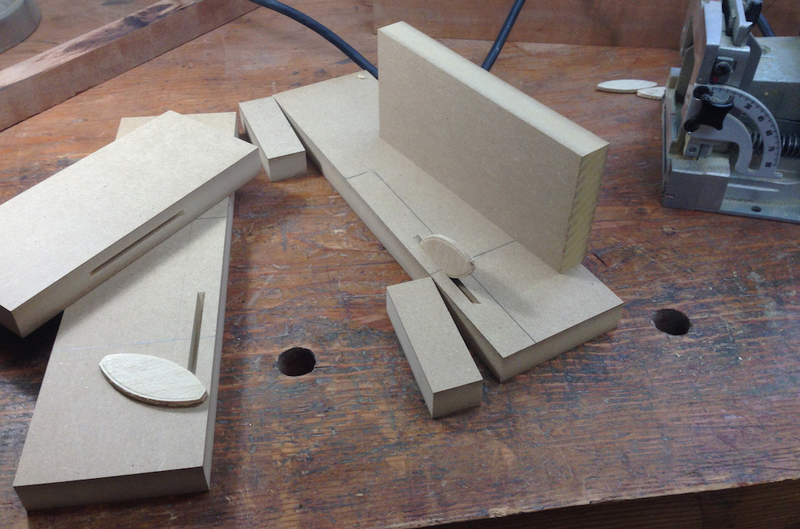 Once I had the design sorted out it was simple enough to cut up some MDF to build the jig. I’ll still need to think through how I’ll make the ebony splines, but I wanted to move forward on building the breadboard ends. 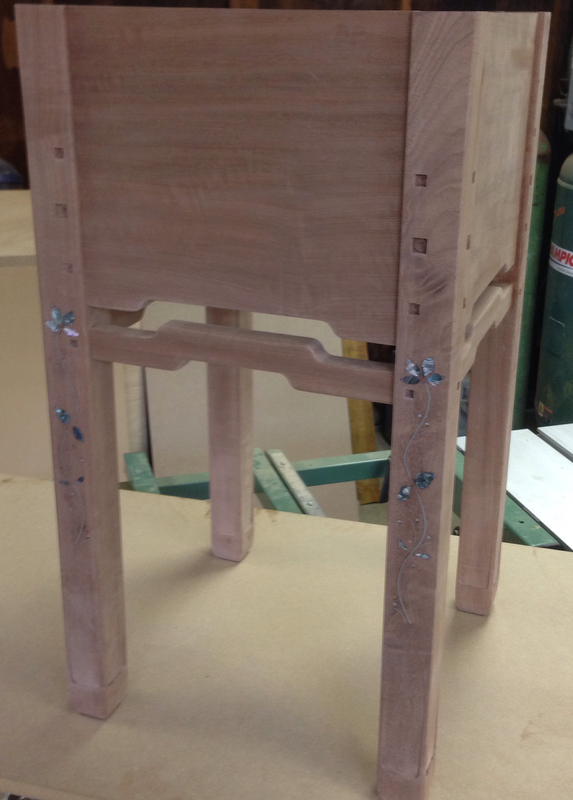 Unfortunately when I started to lay out the tenons on the top I noticed that it was badly cupped. If I wasn’t doing the breadboard ends this probably wouldn’t matter as the top attachment buttons would likely pull it flat. But there was no way I could accurately make the tenons on the end of the top and have them fit the end caps. After staring at this for a while I decided that part of the problem was at the joint between the two boards. 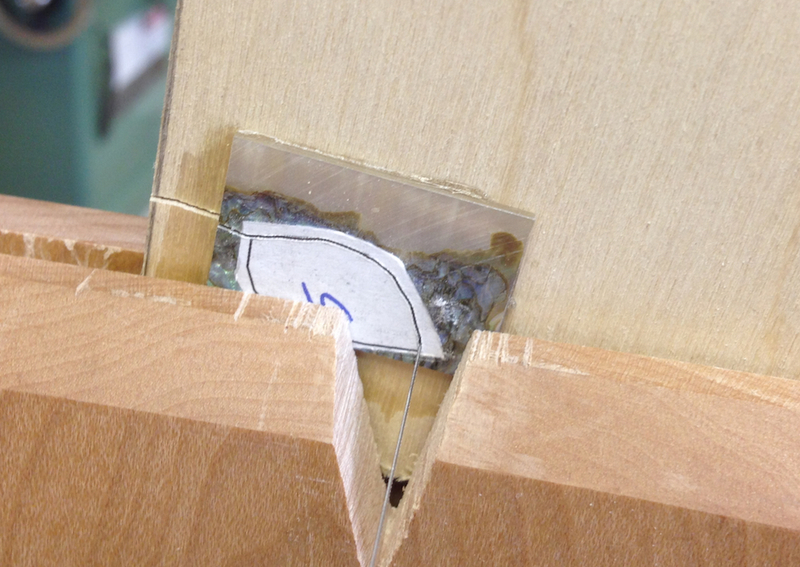 Each half was slightly cupped, but a significant amount of the cupping seemed to be at the glue joint. 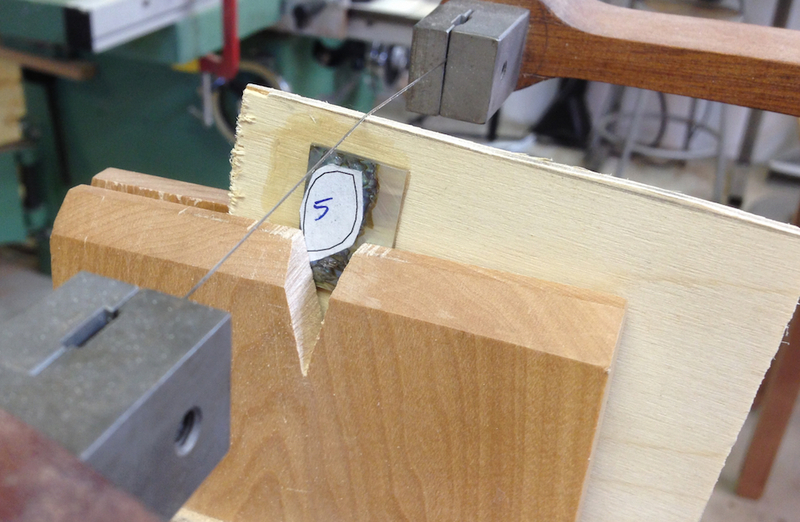 So I decided to rip it apart, re-joint the edges and re-glue it…using cauls this time to keep the joint flat. I make cauls out of some scrap 2×4 material, with one edge jointed dead flat. I covered the edge with clear packing tape so I don’t accidentally glue the 2×4 to the top. The edges are perfectly aligned and the top is flat at this point, we’ll see what it looks like once the cauls come off. I’m going to make the end caps this morning, then take the top out of the clamps and immediately cut the tenons for the ends in case it wants to move. And finally, the table base is out of the clamps. The skirts are all tight, and the base is nice and square. Really, just the top to finish and this table will be a wrap. Completed base. The inlay on the legs isn’t very obvious but should really pop out once I get some finish on this. When building furniture it’s pretty common to have a series of operations that together will make the final component part. As an example, the legs for the table I’m building involved first prepping the rough sawn stock, then making the stepped mortises, adding in the square holes for the ebony plugs, cutting the indents in the bottom of the legs, shaping the tips of the legs and finally doing the inlay and finish sanding. At any step in the process it is possible to make a mistake, and some of these mistakes are difficult to recover from. Careful work and some specific techniques can help prevent mistakes. Skill and experience help, and techniques like carrying an extra part along in the process can help. In making the legs I had enough stock for two extra legs, so I was able to quickly recover when I put the mortises in the wrong place on one leg by making another replacement leg from the extras. Sometimes mistakes still happen, even with skill, experience and careful work. When cutting the slots on the inside of the skirts for the top attachment buttons I had a serious problem. The spiral up-cut bit I was using was (apparently) not tight enough in the router. On one of the skirts it pulled loose and climbed through the skirt effectively ruining the skirt. I could try and fix it, or make another skirt. 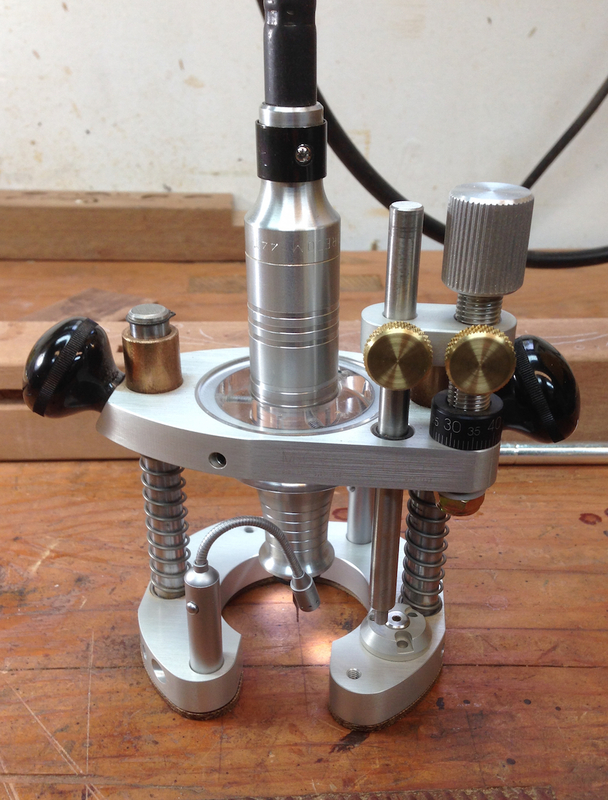 I chose to repair it by drilling a shallow hole with a Forstner bit and putting in a face grain plug. Here is the problem, the router bit climbed out of the tool and broke through on the front of the part. I’ve already drilled one hole for a face grain plug, after it’s installed I’ll drill an overlapping hole to cover the rest of the slot. Completed repair. You can just barely see this when you look closely. I think once the table is finished and assembled it will be invisible. I don’t know what the moral of the story is, other than stuff happens when I’m in the shop. And I’m probably not the only person that has things go wrong. It’s what happens after that matters, both in repairing the mistake and learning from the mistake. Yesterday I wrote about the workmanship of risk (or the workmanship of screwing up as I like to call it.) 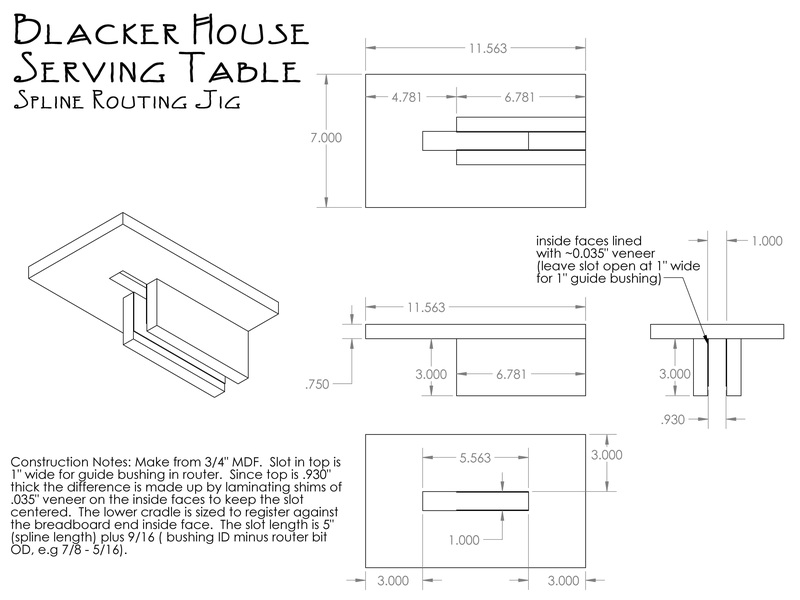 It’s a topic that has been on my mind as I started in on the inlay for the Blacker Serving Table I’m making. 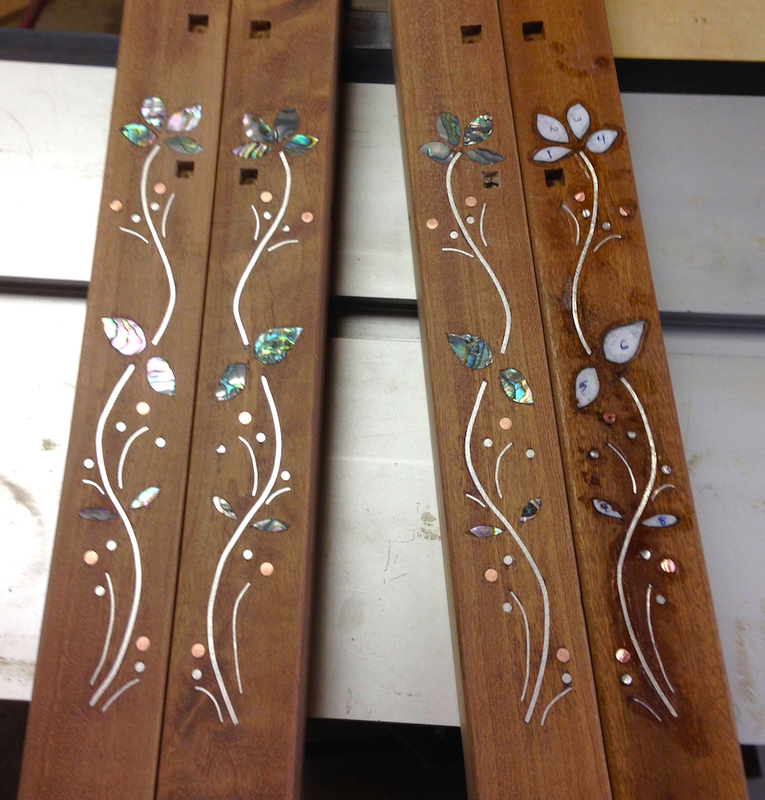 This project is a bit of a stretch for me, I’ve done inlay twice before, both as sample projects that didn’t matter. Now I’m doing a real project, with a very real risk of ruining a part. 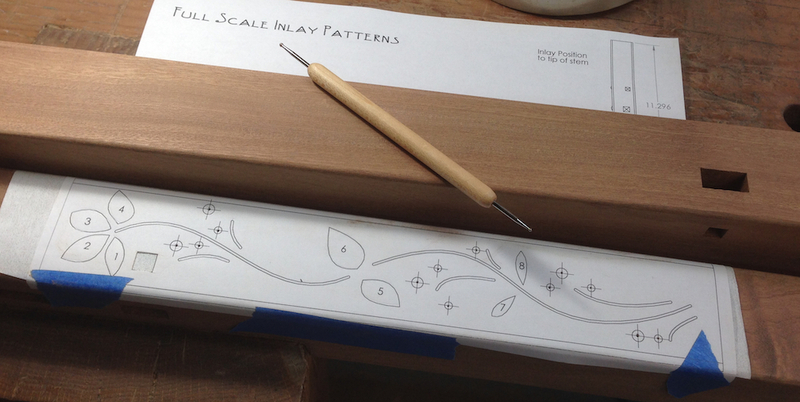 The inlay process is simple enough. Make a cavity and stuff some contrasting material into it. It’s the making of the cavity where the risk comes in. 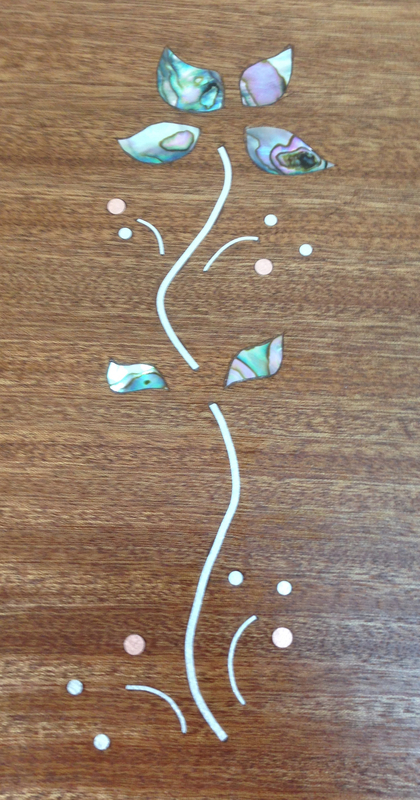 For the petals on the vine motif I’m doing I have cut out Abalone shell that I’ll inlay. 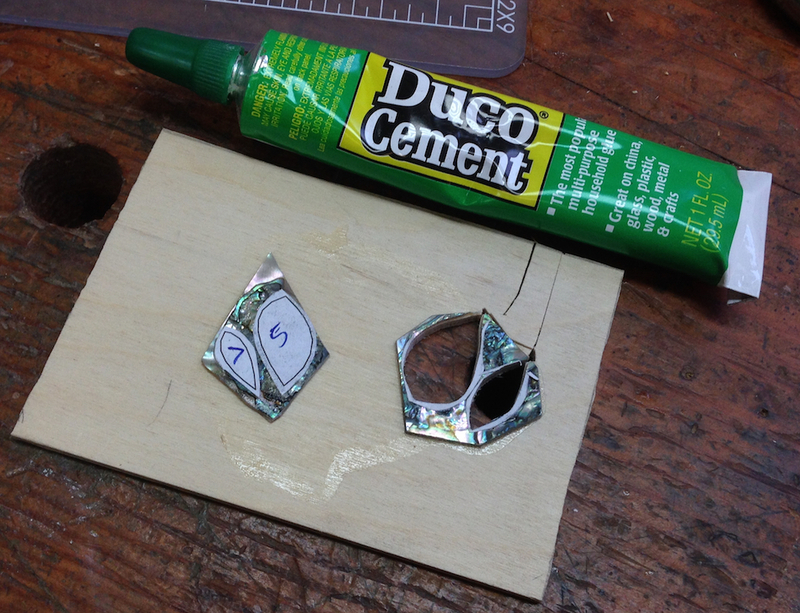 To create the cavity I’m using a micro router to freehand the opening using 1/16″ and 1/32″ bits. 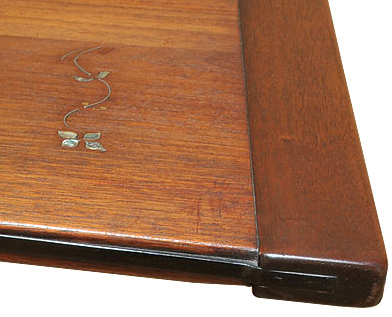 When I first did inlay I tried using a router base from William Ng, but wasn’t satisfied with it. The screws to set the depth didn’t hold when routing and the depth would drift deeper. I returned it and eventually got this tool from Micro Fence. It can use a variety of Dremel-like tools for power, I’m using my Foredom flax shaft tool. I like this tool a lot better, it holds depth properly, is easy to adjust and has a real plunge mechanism unlike the Ng tool. But the point of showing it is to demonstrate the risk of the operation. 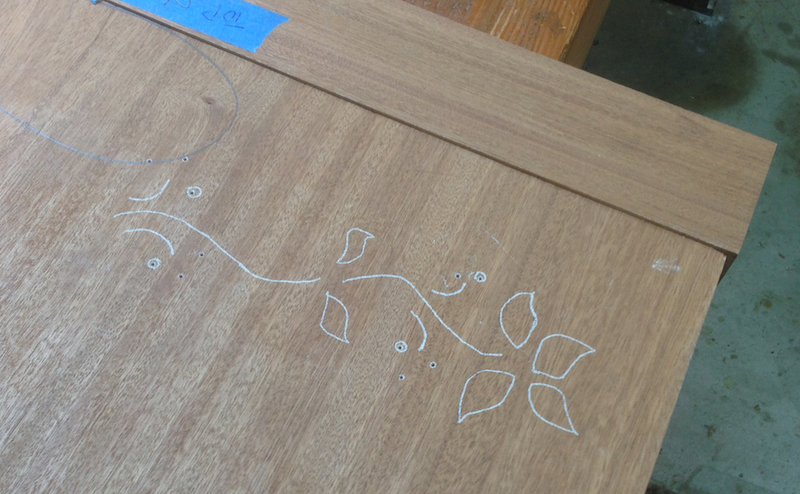 Most of the work is done using a 1/16″ bit and freehand routing the cavity that the inlaid material will sit in. 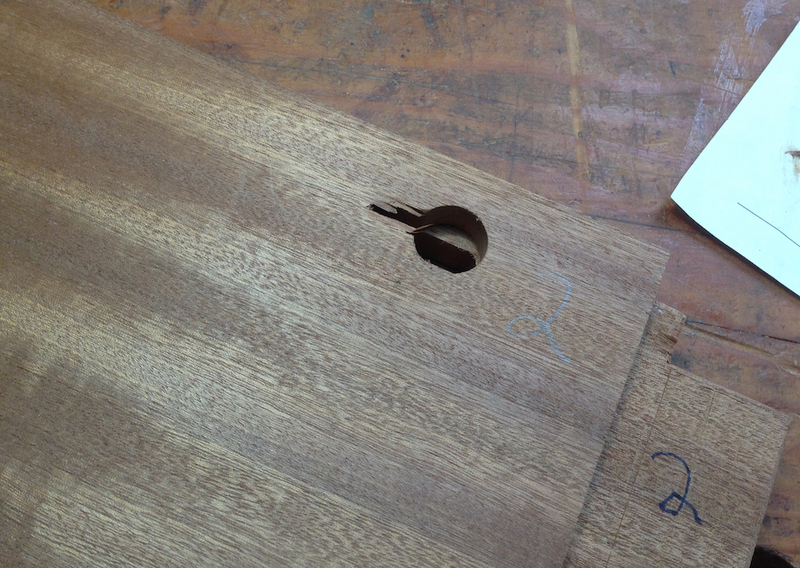 If it’s too small the material won’t fit, if it’s too big you have ugly gaps around the inlay. 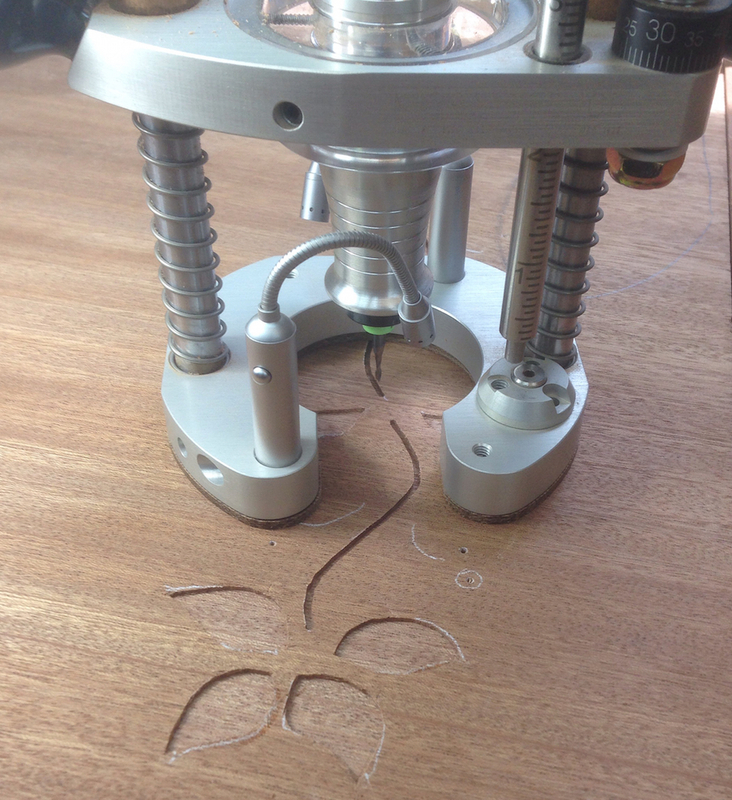 I spent a couple of hours staring at this tiny bit through 5x magnifiers while routing out the legs. The very first leg I tried on I lost control and made a bad cut for the silver vine, which is also freehand routed. It wasn’t the end of the world, although it felt like it at the time. Luckily I was able to move past that and finish the inlay in the first leg, here it is sanded flush and (mostly) ready for finish. It’s far from perfect, but when it’s part of the table, has finish applied and is viewed from three feet away it will look great. The silver wire is 1/16″ and 1/32″ thick square Argentinium Silver — a Sterling Silver alloy that is tarnish resistant. The dots are 1/8″ round silver wire and 3/16″ copper round bar in drilled holes. I learned some tricks doing this first leg, and I’m working on the other three legs right now. 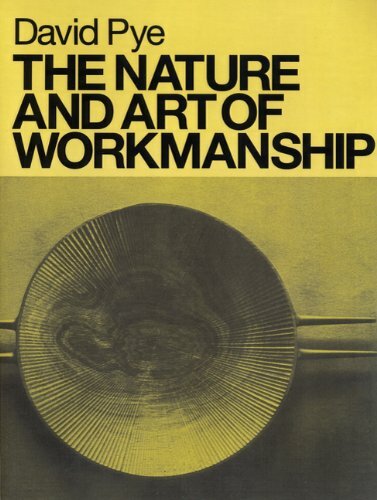 Something I’ve heard mentioned a number of times over the past couple of years is the phrase “workmanship of risk”, which is a reference to David Pye’s book “The Nature and Art of Workmanship”. I haven’t read the book, but I found some excerpts online that I read. It’s an interesting line of thought, if a bit more scholarly than the usual stuff I read. I’ve just ordered the book from Amazon and am looking forward to exploring these ideas more. There were a couple of bits that caught my interest. First, and I think this is generally a topic of interest for woodworkers, is putting a definition around craftsmanship and “hand made” versus “machine made”. Instead of trying to specify the kind of tool used to build something as its level of craftsmanship, he talks about the risk to the outcome. 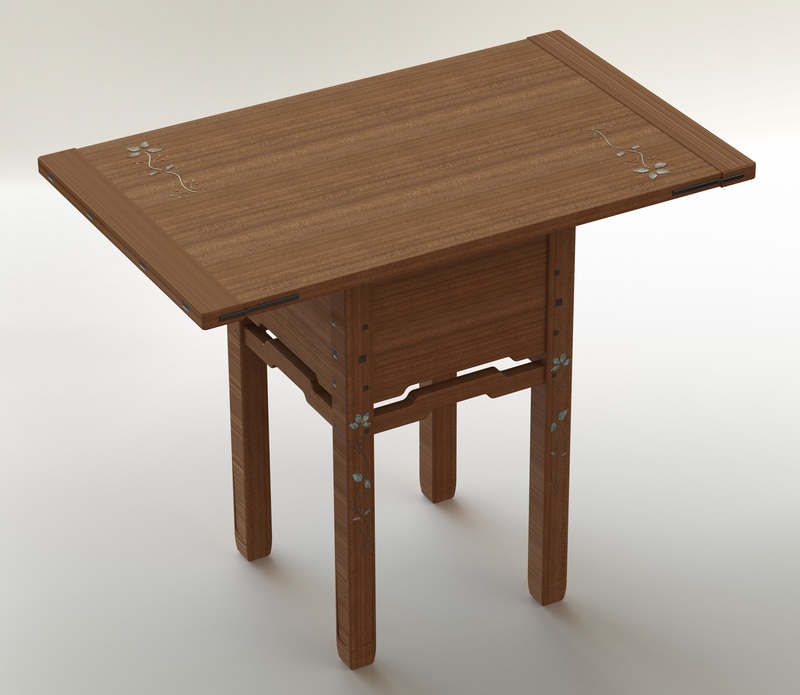 Manufactured goods, like your average flat-packed Ikea table, have no risk to the outcome. 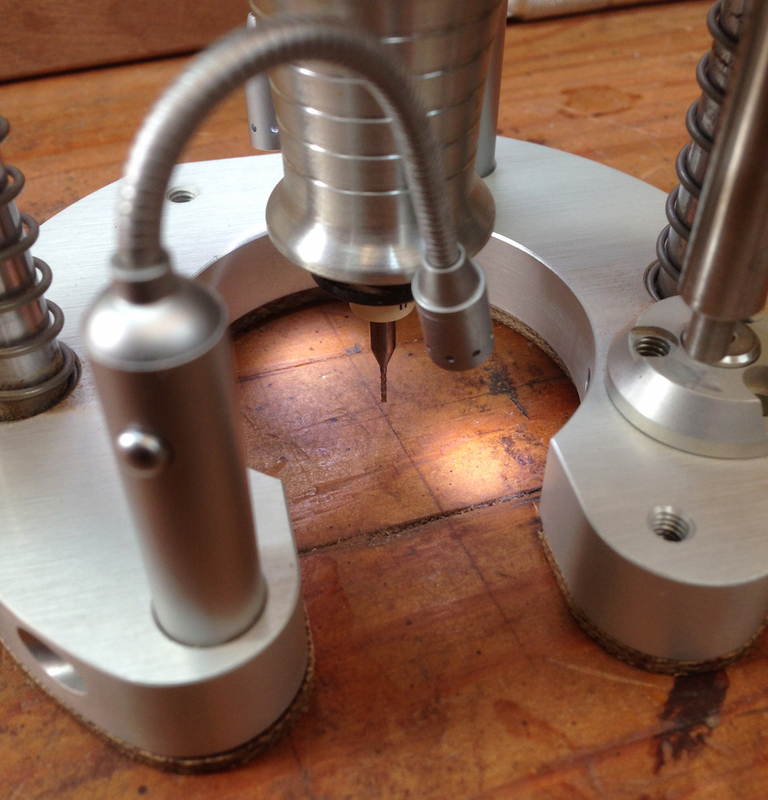 The design and outcome are completely fixed and dependent on automated mechanical processes. Whereas with “hand made” or “workmanship of risk” the outcome is at some level of risk throughout the process of being built. This second idea of risk resonates particularly with me. When I’m building something I’m focussed on each detail. I expect that everyone is like that, but I tend to be particularly hard on myself. I also don’t mean to say that I do a great job on every detail, and some I royally screw up. Again, I’m sure I’m not alone in that, although I have to say mistakes, even ones easily corrected, really throw me for a loop. This makes thinking about the processes, meaning and value of the exercise worth examining for me. The following is the opening paragraph from page 20 of his book. If I must ascribe a meaning to the word craftsmanship, I shall say as a first approximation that it means simply workmanship using any kind of technique or apparatus, in which the quality of the result is not predetermined, but depends on the judgement, dexterity, and care which the maker exercises as he works. The essential idea is that the quality of the result is continually at risk during the process of making; and so I shall this kind of workmanship, “The workmanship of risk”: an uncouth phrase, but at least descriptive. … With the workmanship of risk we may contrast the workmanship of certainty, always to be found in quantity production, and found in its pure state in full automation. In workmanship of this sort the quality of the result is exactly predetermined before a single salable thing is made. Workmanship, especially within the scope of Pye’s definition, makes sense to me and can be something that can bring great joy on a good day. It’s a concept that is a core value for me, and some days is acutely elusive. I doubt I’m alone in that feeling, and I’d love to hear your thoughts on the subject. Holy Abalone. I’m really nervous about doing the inlay for this table I’m building. 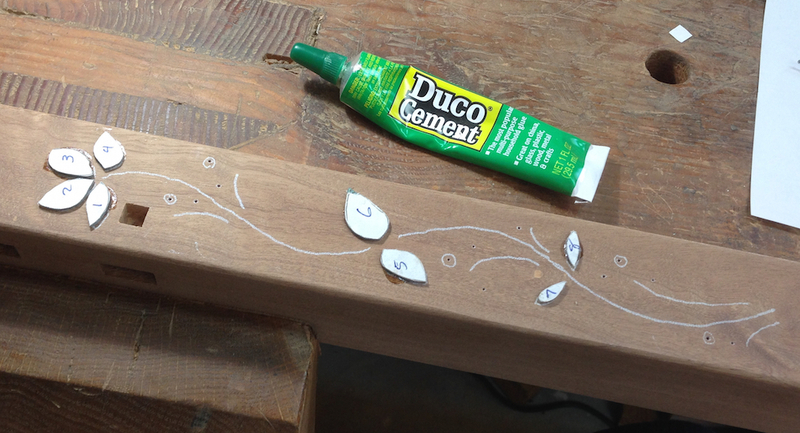 I’ve never done inlay on a real project, and this feels fairly risky. 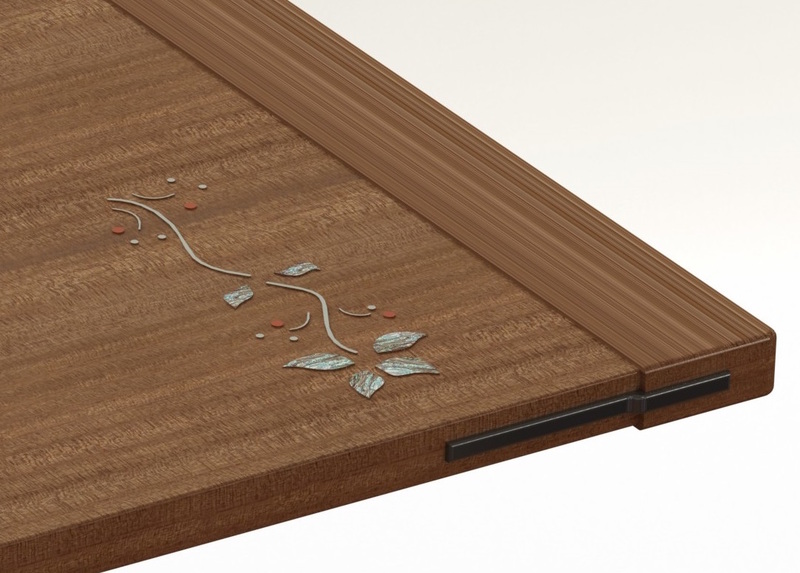 It could ruin the table or it could make it great, and the difference is how nicely the inlay fits. So, I have to either do it or not, and I’m going for it. 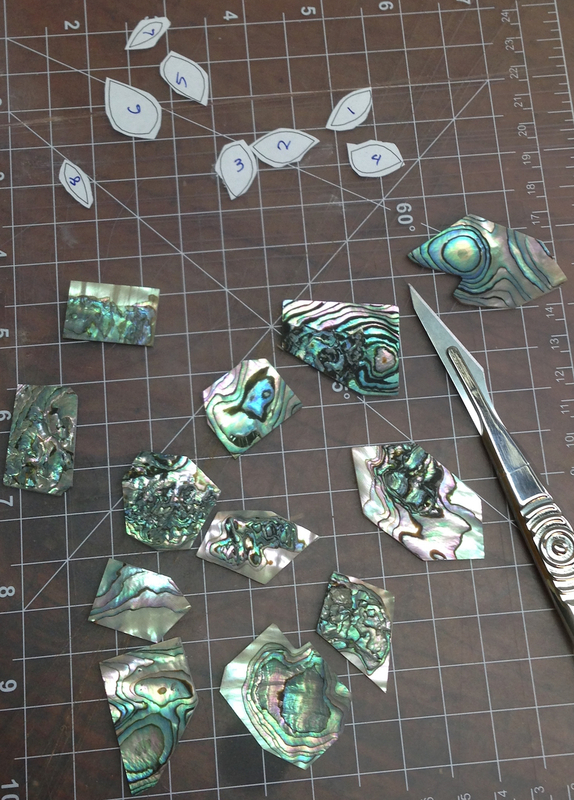 The first step is to cut out the 32 little pieces of Pau Abalone for the petals. 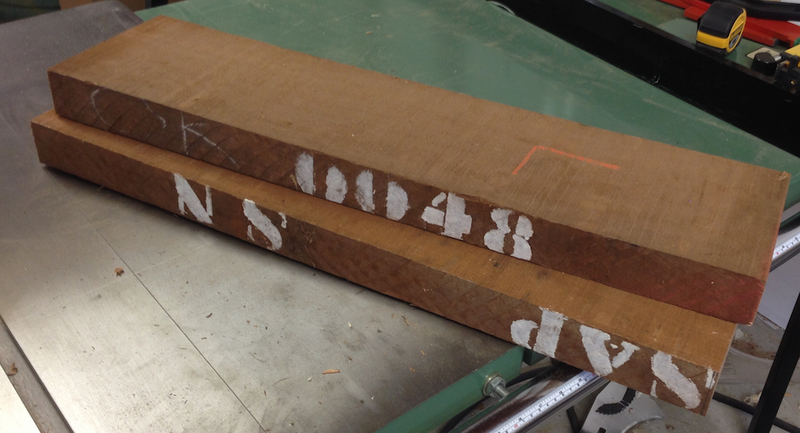 The shell blanks are maybe 3/4″ by 1″ or so — they are irregular shapes. I cut the pattern out with a scalpel, leaving the line. I also quickly realized I don’t have enough shell for the job. Rats. Some of the patterns cut out. 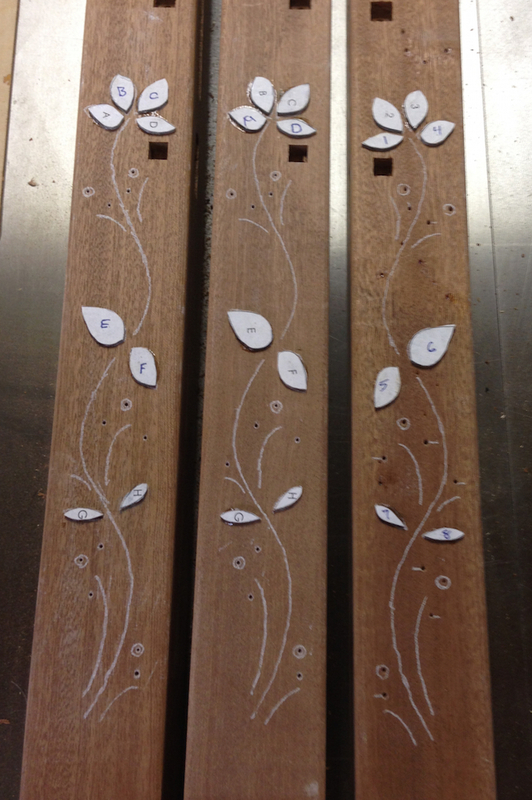 The inlay goes on the front faces of the legs — only four sides total. 8 unique pieces per inlay design, 32 pieces total then. 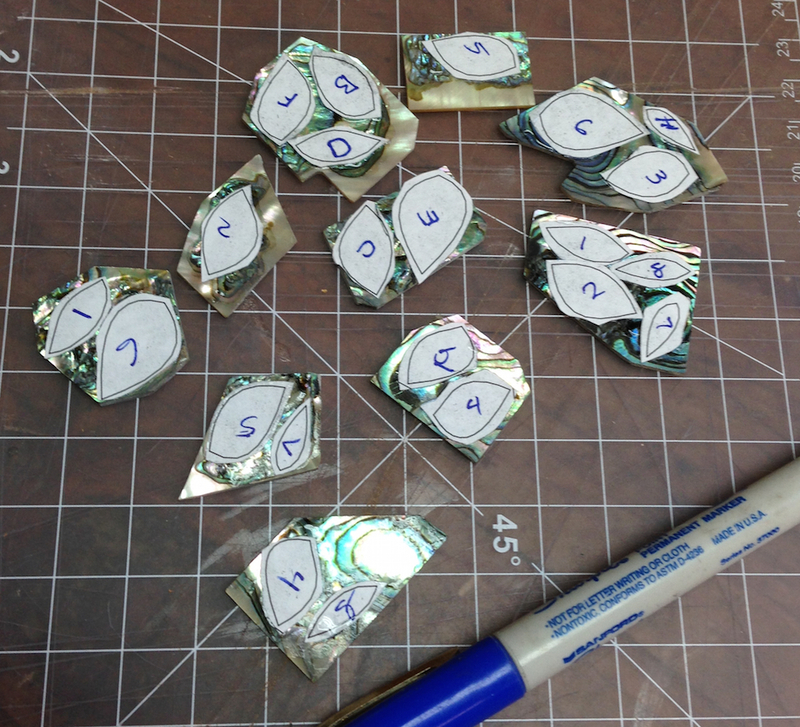 I super-glued the patterns to the shell, trying to orient as many per blank as I could — while avoiding the boring areas of the shell. This stuff is really pretty, but a bit spendy, about $50 per ounce and I’ll need a bit over one ounce…assuming I don’t screw any up. Patterns glued down. 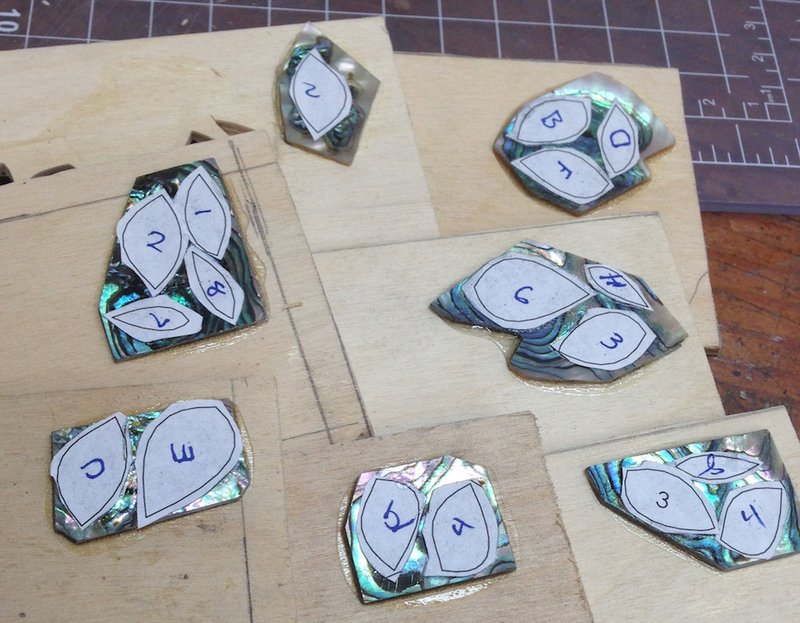 At least patterns for three legs, more Abalone is on it’s way. I have two options for cutting these out. I could use a jeweler’s saw and bench hook, or the chevalet. The problem with both is hanging onto the little pieces of shell. It’s really brittle, and using the jeweler’s saw I’ve had pieces snap off, plus I’m more comfortable with the chevy. But how to hang onto these? 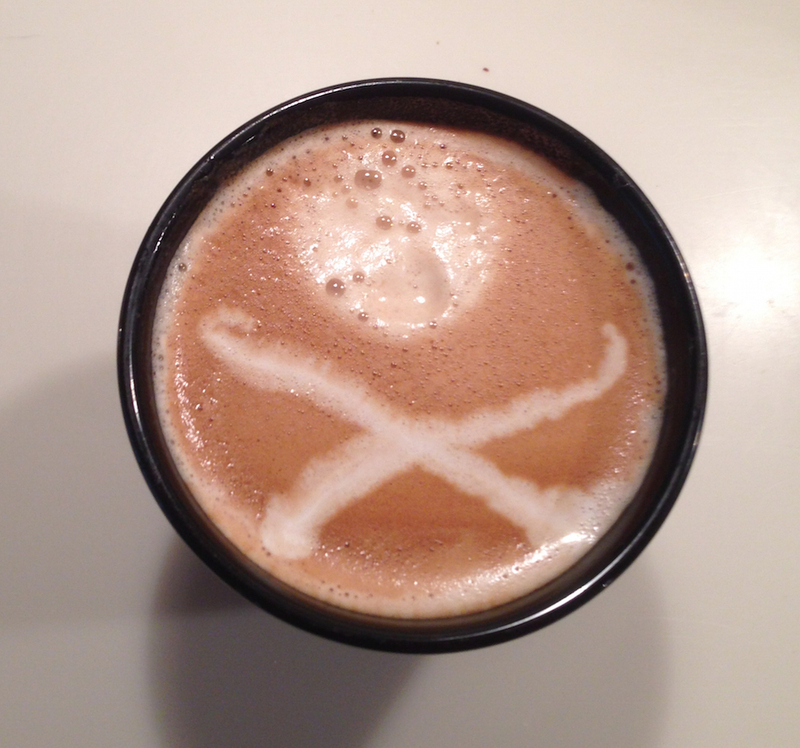 I made a cup of skull & crossbones espresso and thought about it. What if I glued the little shell blanks to something so I could hang onto them? 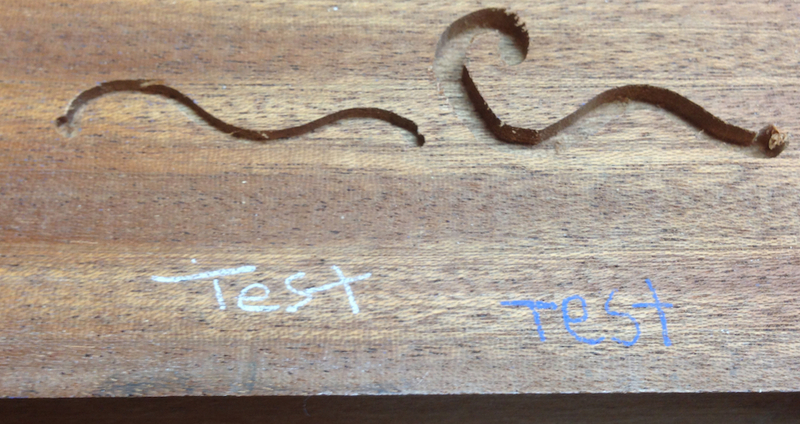 I had a scrap of 1/8″ plywood in the shop, leftover from god-only-knows-what. I tried gluing a shell blank to the plywood, and cutting the whole affair out. It actually works pretty well. The wood gives me something to hang on to, and does a nice job supporting the shell so it doesn’t crack while I’m sawing it. I’m even using the coarse 32tpi blades, look at me go! The trick here is to use a glue that just barely holds the shell to the wood. Duco seems to be the ticket, it dries pretty quickly and with a little care seems to hold the shell well enough to cut, but still pops off easily. It’s the same stuff I’ll use to hold the cut shell in place on the leg to scribe around them. The sawing goes fairly quickly, when I get a little block of shop time I should be able to knock these out in less than an hour. This is also pretty low risk, I might ruin $5 worth of Abalone with a bad cut, but until I take a router to the table legs I’m safe. The first three petals cut. I’m not exactly on my line in a couple of spots, but since each one gets scribed and fit individually it’s OK as long as the shape is not distorted.